Alleged bias against locals accounted for half of the employment-related complaints received in Singapore last year, in another sign that the city-state may scrutinise more closely firms which are hiring foreigners to fill higher-paying jobs. 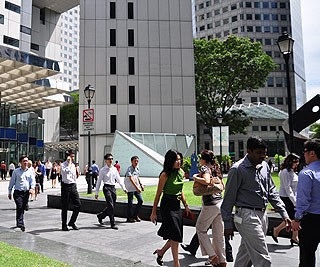 The data provided to Reuters by the Tripartite Alliance for Fair Employment Practices (TAFEP) comes amid growing unhappiness among Singaporeans about the surge in foreigners over the past decade. TAFEP is a body backed by the Ministry of Manpower and tasked with ensuring fair work practices in the small island-state, which as a global financial, business and transport hub attracts hundreds of thousands of higher-paid foreign workers. Singapore has already taken steps to curb demand for low-wage, low-skilled foreign workers through higher levies on companies and tighter quotas, and Acting Manpower Minister Tan Chuan Jin will discuss in detail plans to help Singaporeans aspiring for higher-paid jobs when his ministry's budget is discussed next Thursday or Friday. The increased vetting of applications to hire skilled foreigners -- typically those earning more than S$3,000 ($2,400) a month -- may hit banks such as Citigroup, which has around 10,000 employees in Singapore. Such hires are exempt from the levies imposed on firms recruiting lower-cost workers. "In 2012, about half of the 303 complaints received by TAFEP were regarding fair opportunities for Singaporeans," a spokeswoman for the organisation said. The Ministry of Manpower said in a separate reply to Reuters that TAFEP will refer unresponsive employers to the ministry, which will in turn curtail work pass privileges of firms that did not heed its advice. TAFEP earlier this week published advertisements in local newspapers saying it had met senior management at some financial firms after it got feedback that some supervisors preferred to hire their own countrymen over Singaporeans. "A few firms acknowledged that certain departments did seem to have "hot spots" where clusters of employees from the same country appeared to have developed over time," the advertisements said, although TAFEP also cited an example of a complaint that was not justified. Singapore last month unveiled a budget heavy on social spending and announced new curbs on companies hiring foreign workers as the city-state tries to reduce its dependence on overseas labour and address a widening income gap. In budget debate earlier this week, several lawmakers from the ruling People's Action Party (PAP) voiced concerns about locals being denied a fair shot at white collar jobs. Liang Eng Hwa, a member of Parliament who is also a managing director at DBS Group, questioned the large number of foreigners holding managerial positions in areas such as human resources, auditing and general administration -- skills that should be relatively easy to find in Singapore. Singapore is one of the world's most open economies, with foreigners accounting for about one-third of the workforce. Currently, it is even more liberal than Asian rival Hong Kong in terms of the ease in which firms can hire foreign professionals. While the former British colony also has a large expatriate population, employers wanting to hire a foreigner must provide proof that the job cannot be readily taken up by the local work force. Employers must also provide remuneration packages that are in line with the prevailing market standards in Hong Kong -- a condition that makes it harder for firms to replace local managers with lower-cost replacements.